Finnish company HMD Global Oy is unveiling and showing off its all new feature rich Nokia 7 Plus and is also combining it with the launch of a few other smartphones in India later today. The company has setup a professional event with the keynote speaker to give out a presentation at 12:00 pm in New Delhi. It has also made arrangement for online users with the airing of its webcast of the entire program so that anyone anywhere can catch the live broadcast of their smartphones on their PCs or devices. What can you look forward to in Nokia Mobile India Launch 2018 Event? It has been a secret as to which products are going to be launched by HMD Global Oy and their specification on Wednesday, the teaser image has been launched on their official Facebook handle and also by the companies vice president Ajay Mehta on Twitter in the past one week, which have led to speculations that Nokia 8 Sirocco edition and the Nokia 7 Plus will be announced for sure. There are also possibilities that the company HMD Global Oy might release the cost of its genuine product Nokia 6 (2018) but its launch is also a few months away. Last year, the company launched its Nokia 5,3 and 6 series into the India market, but it was launched at different times. Nokia 7 Plus: it has the features included along with a 6-inch HD+ (2160 X 1080 pixels) FullView screen having 18:9 aspect ratio. It also comes with 2.5D curved glass cover and Gorilla Glass 3 Shield on top. Insides of the mobile include a superfast Qualcomm Snapdragon 660 processor, 4GB RAM, Android 8.0 Oreo operating system, 64GB storage with microSD card slot, and a dual main cameras, one 12MP primary shooter with f/1.75 aperture, 1.4µm pixel size with ZEISS optics and a secondary 13MP snapper with 1.0µm pixel size, f/2.6 aperture with ZEISS optics, dual-tone LED flash and a fingerprint sensor. Nokia 8 Sirocco: This is a high end phone and comes with a glossy premium cover on the back and a 5.5-inch QHD (2560 x 1440 pixels) pOLED display to the users who view the screen have 700 nits brightness and is protected by sculpted Corning Gorilla Glass 5 protection. Plus it comes with a IP67 water and dust certifications, hence it can survive under water up to 3 feet under for about 30 minutes. Under the hood, it houses a Qualcomm Snapdragon 835 octa-core processor, 6GB DDR4X RAM, 128GB (UFS 2.1) storage (expandable up to 256GB via microSD) and Gen 1, NFC and a 3260mAh battery with fast charging (Qi Wireless Charging Standard) via Type-C 3.1 USB port. Nokia 8 Sirocco is also coming with a worthy and boasts a top-of-the-line camera hardware. It features a 12 MP primary shooter with 2L7 wide-angle lens, 1.4 µm pixel size, f/1.7 aperture and is complemented by 13MP secondary snapper with 3M3 Telephoto lens, 1.0 µm pixel size, f/2.6 aperture, dual-tone flash and 2x optical zoom. Below, it features a fingerprint sensor. On the front, it sports a 5MP camera with 1.4um pixel size. Nokia 6 (2018): It sports a 5.5 inch full HD screen having 2.5D curved glass cover with Corning Gorilla Glass 3 protection on top. It comes with a top of the line processor, a Qualcomm Snapdragon 630 processor, pure Android 8.0 Oreo, 3,000mAh battery with fast charging, a 16MP rear camera with f/2.0 aperture, dual-tone LED flash, ZEISS optics, and 8MP front-facing camera. 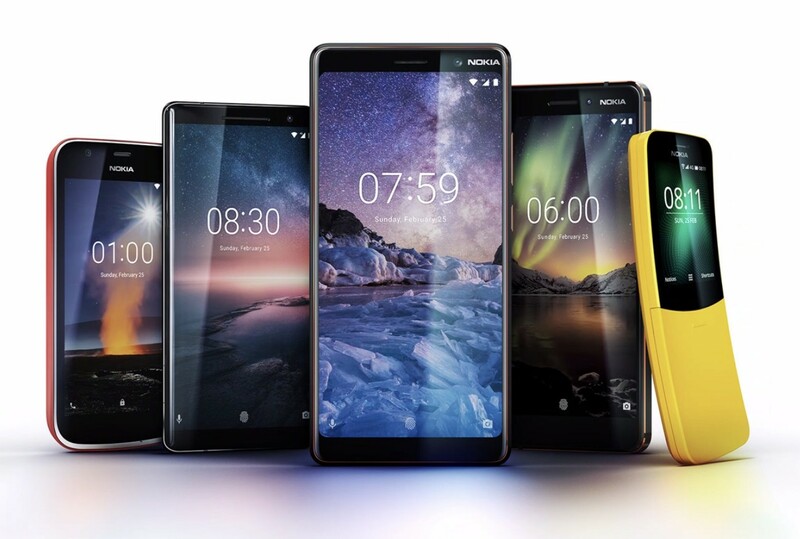 The company has promised to launch a software update which will improve on the camera functioning including the Nokia’s Dual Sight/ Bothie feature, which is available in flagship Nokia 8 Series.